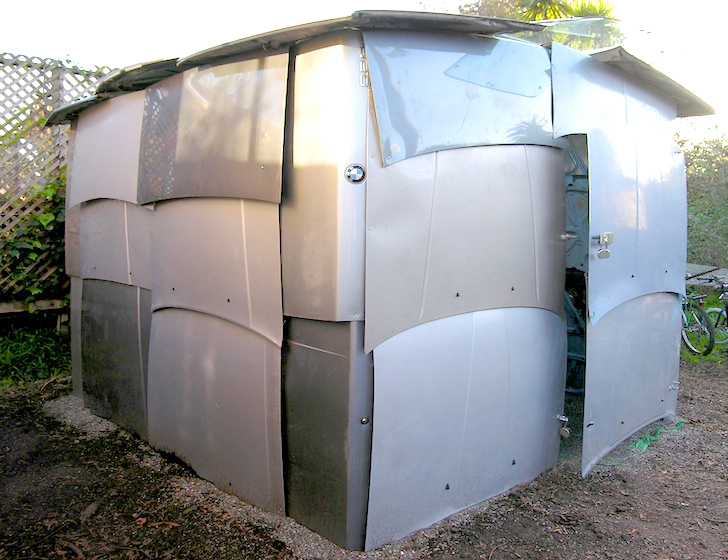 Leger Wanaselja Architecture built the wacky "Part-thenon" shed completely out of old car hoods and other parts. All over America junkyards are filled to the gills with old cars that do little more than blight the landscape. Keeping this in mind, longstanding green builders Cate Leger and Karl Wanaselja decided to make a cool structure entirely out of salvaged hoods, bonnets, and windshields. According to Karl, who did all of the construction work, this shed is surprisingly sturdy and water tight. It receives all of its support from the car parts and he even pre-tensioned the roof so that it acts structurally like a shallow dome, he told us in an email. 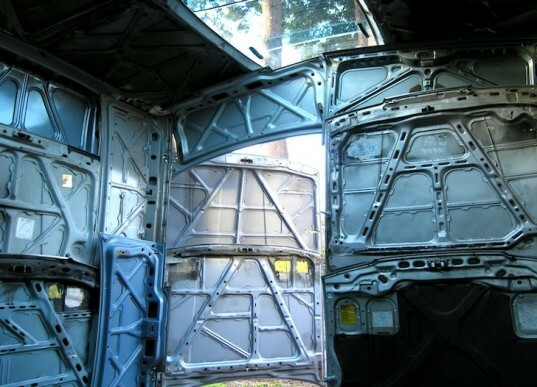 Gaps in the car hood and trunk “shingles” – as he calls them – ensure that the shed is well-ventilated and the Mazda skylights allow all kinds of daylighting to penetrate. The Part-Thenon is a temporary structure with a tiny footprint. It doesn’t have a foundation since it was built over a gravel trench, and although the design couple briefly considered using their favorite project as a mini guest house, it retains its purpose as a storage shed. Albeit quirky, this is definitely one of the finest examples of adaptive reuse we’ve seen in a while. Maybe it will start a trend? At one point the couple considered using the shed as a guest room, but decided to leave it as storage instead!